Leave checked to receive news about the book (updates, corrections, etc.) and gnuplot. Uncheck for total silence. Gnuplot, a free and open-source program, is the preeminent graphics system for scientists, engineers, and analysts. It integrates seamlessly with LaTeX to produce beautiful and professional technical documents. Gnuplot also makes interactive graphs on the web and visualizes live data streams; it can be used standalone or plugged into any programming language. 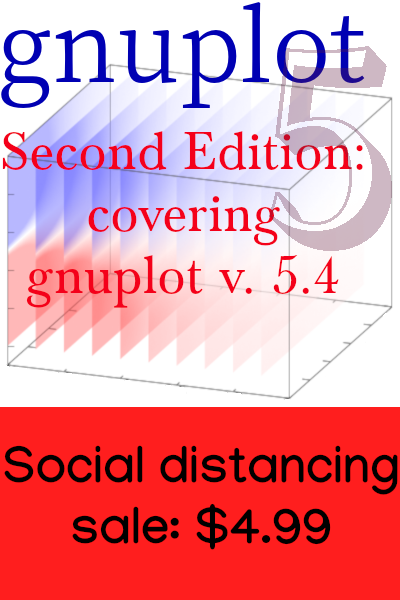 Gnuplot 5 is a practical guide to gnuplot, including all the new and powerful features in the newly-released version 5. The beautifully formatted e-book is an interactive visual reference: find a picture resembling the graph you want to make, and see the gnuplot commands that create it, with instructions on how to customize the plot for your needs. Be finished in minutes, without wading through hundreds of pages of documentation looking for an obscure setting. The author of Gnuplot 5 has built on the experience and feedback gained from his previous book, the popular gnuplot Cookbook, to create a new type of interactive reference. The Cookbook covered gnuplot up to version 4.6; Gnuplot 5 covers all of gnuplot, including every powerful new feature in the most recent release. Gnuplot 5 is entirely DRM-free. Once you purchase a copy, you will have the right to make as many backup copies as you wish, and read the book on as many devices as you desire. If you lose all your backups, you can download it again, for no charge. You may do whatever you like with the book, short of distributing copies of it (but lending your copy to a friend is cool). There are two versions of the book, with typography and layout hand-crafted for laptops and tablets. Your single purchase price entitles you to both of these versions, and any others that we may create in the future. Each version is interactive, responding to your touch or mouse click to take you from the plot you want to create to the gnuplot commands to get you there. Customers: You can access your book files and all supplementary material at this link. You will be asked to log in with your registered email, and your access code, which you received after you made your purchase.